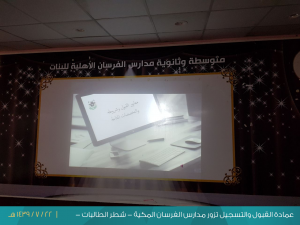 As part of the community partnership between the Deanship of Admission and Registration with Makkah region schools, a team from the Deanship of Admission and Registration, females section, visited Al-Fursan secondary school for girls in Makkah on Monday Rajab 23, 1439 H. the deanship team included Mrs. Rania Siraj and Mrs. Hanan Sharia. The Deanship was received by the School Headmaster Mrs. Sohaila Mohamed Sabhani, the Deputy Headmaster Mrs. Widad Al-Mourki and Partnership officer Mrs. Amina Al-Barakati. 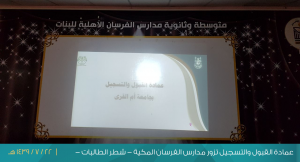 At the beginning of the visit, a presentation was made about the standards and conditions of admission at Umm Al-Qura University besides other types of admission and available colleges and majors. The presentation also included explanations of the personal information registration steps in the UQU Admission e-Portal. Then the Enquiries of the female students in the schools were answered. At the conclusion of the visit, the Deanship team extended, on behalf of the Deanship Vice Dean Dr. Fatima bint Ali Al-Ghamdi, thanks to the school for the good cooperation and reception.